Another brew from Mr. Wheeler’s book. No wet yeast this time as I didn’t know if I was going to brew this weekend until too late, so it’s a pack of S-04 for this one (seemed a better choice than Windsor, which is the only other dried yeast I have in). A bit of a boil-over today, following the first stuck mash I’ve had in absolutely ages. Hope these aren’t omens for the rest of the brew! Also got a bit of mildew in the garage where I brew, fortunately nothing inside any of the vessels, so it could be worse. I need to have a go at sorting it out, though. 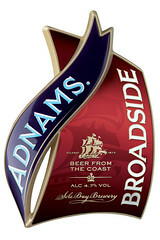 The Adnams website says they use First Gold hops, but GW’s recipe called for Challenger, so that’s what I’ve gone for. There’s also acid malt in the grain bill, so I’ve also skipped the water treatment today as well. A little less evaporation, maybe – 28 litres at the end of the boil, at 1.046, so pretty good. 2013-02-17: Bottled 13, the rest in a corny keg.